The Third Pillar of Dana has one of the better approaches in the Sierra. It's easy to follow, fairly direct, and really pretty. This climbers path travels around Tioga Lake and winds through the woods before following a creek up into Glacier Canyon. Eventually it wanders through a lovely alpine meadow dotted with granite boulders and disappears a few minutes before climbers reach the top of the route. In the summer wildflowers add all sorts of color to the whole thing. In many places this path is an aesthetically pleasing single track. However, around 10,500 feet (I'm guessing at this altitude from memory and the map, not a gps waypoint), the path passes through several marshy areas and in a few places is starting to become wide and messy. "Travel and camp on durable surfaces" is a basic Leave No Trace principle. In the case of the Third Pillar approach this should be fairly easy; just walk right in the middle of the path. The human impact is already there, and this durable surface (bare ground) can take the abuse. What's going wrong in this area around 10,500 feet is that us climbers are not walking in the middle of the trail. When we get to these marshy sections we skirt around the edges, killing the plants there and slowly widening the way. Why are we doing this? It's wet and muddy there. That's right, I'm calling out my fellow climbers for being afraid to get their shoes a little wet or muddy. It seems odd that a group of humans that will live in their cars for months on end, forgo showers, and purposely put themselves in physically and mentally challenging situations are unwilling to get their approach shoes dirty, but that's the explanation for the unnecessary impact. 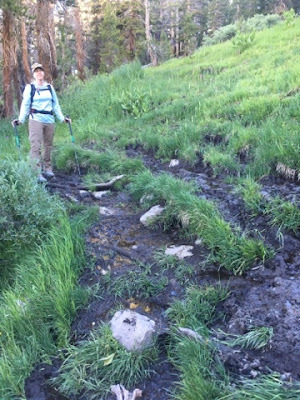 We might feel badass when we're romping up the last pitch of The Third Pillar, but we can't manage to do the right thing when faced with a few feet of muddy trail. Not so tough after all. If a call out won't work, how about the reality of the situation? I've been lucky enough to climb The Third Pillar of Dana twice so far this summer, once while guiding and once with my wife. I wore a different pair approach shoes each time and each time I tried walking directly through the muddy sections of the path. I took the photos below just after. Not so bad, right? The mud barely made it past the rands. "But what if my approach shoes have mesh on them and some of that muddy water makes its way in" you ask. This is a mountain range known for its fair weather. 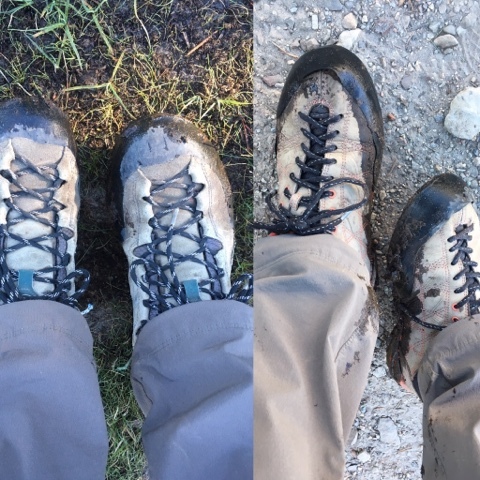 If you walk right through the mud and your feet get a little wet and dirty, fear not gentle reader, they'll dry out in the warm California sunshine and light winds that you'll get over the rest of your day of climbing.